One more cookie recipe to share with you from my recent baking frenzy in the test kitchen! 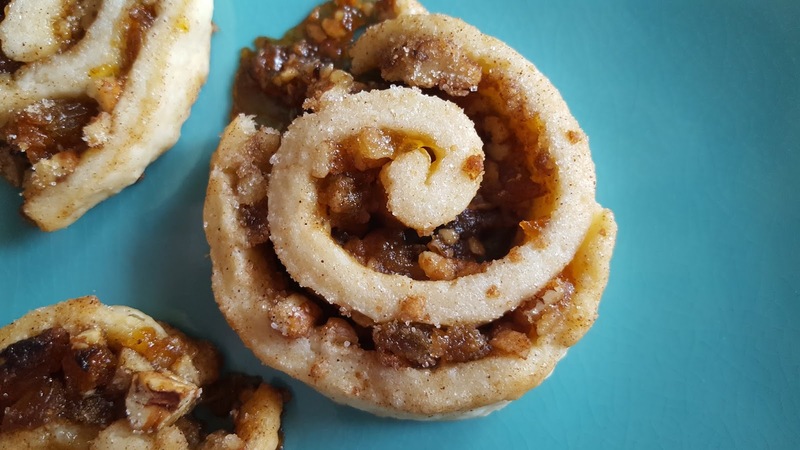 These are really like little cinnamon roll cookies, stuffed with a chewy, sweet, lightly cinnamon spiced filling of chopped walnuts and golden raisins. The cream cheese dough is super tender and makes a wonderful base for these special cookies. I cut these a fair bit thicker than the original recipe called for - it suggested 1/4" thick - mine were probably at least half an inch thick. 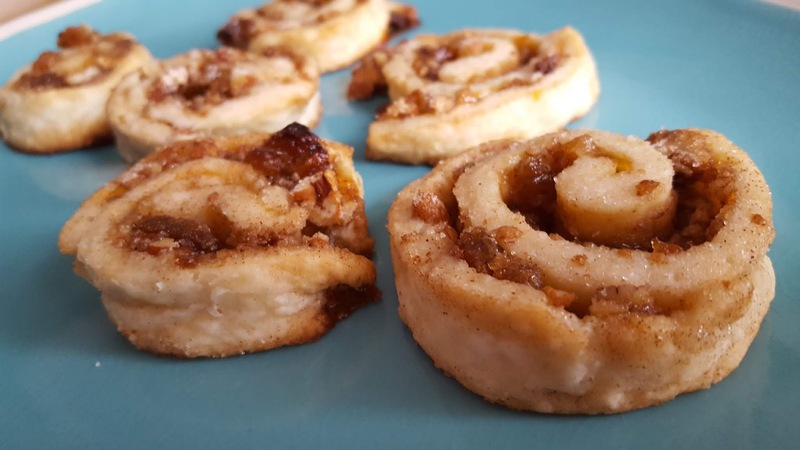 Definitely more like little cinnamon rolls than little cookies. It's some sort of delicious hybrid! These are very pretty for a Christmas cookie platter - or maybe a Christmas brunch. My 5-year old has continued to be sick the past few days and our binge watching of Pioneer Woman has also continued (thank you Food Network channel on Roku!) and we definitely had some creamy cheesy things for dinner last night that I'm pretty sure were inspired by watching so many of her delicious cowboy-friendly recipes. I'll be sharing a Cheesy Hashbrown Casserole soon - it went perfectly with some roasted turkey for dinner the other night. Blend the room temperature butter and cream cheese together in the bowl of a stand mixer until smooth and creamy, scraping down the sides if needed. Add in the flour and blend until smooth. Slowly add in the 2 cups of flour, on low speed, just until combined into a smooth mixture (dough will be sticky). Cover the bowl and place in the refrigerator or scrape dough onto plastic wrap, and wrap tightly and refrigerate at least 2 hours. 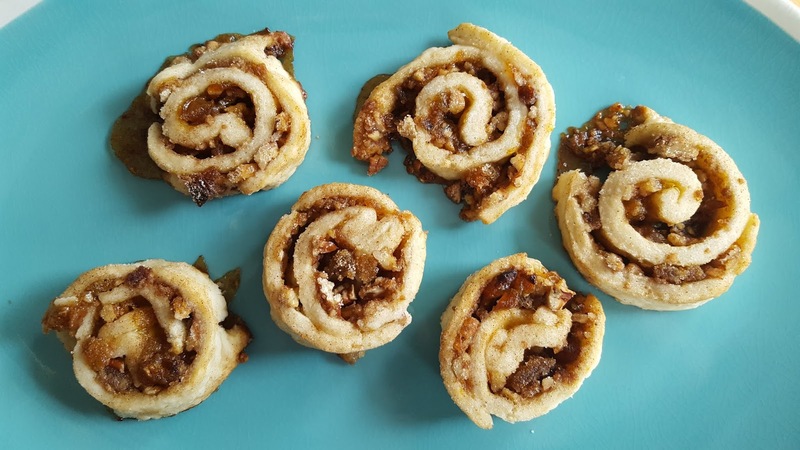 Prepare filling by combining all filling ingredients except the apricot preserves in a medium sized bowl and gently stirring until well combined. When dough is well chilled, cut in half. Lightly flour the counter and a rolling pin and work the first section of dough into a rectangle, about 1/8" thick. Spread half of the apricot preserves all over using a spatula or back of a spoon, then sprinkle half of the filling mixture evenly over the preserves. On the long side of the rectangle, carefully roll the dough up - as tightly as possible to prevent gaps, but gently as well to prevent any tears in the dough. Once a log is formed wrap this carefully in plastic wrap and place in the refrigerator. Repeat with the other half of the dough and filling ingredients. Allow the logs to chill for at least 1 hour. When ready to bake, preheat the oven to 350 degrees and prep a baking sheet with a silpat liner. Prepare the coating by combining the cinnamon and sugar in a bowl. Carefully slice the cookies about 1/4 - 1/2" thick depending on your preference. Gently press them on all sides into the cinnamon sugar mixture. Fit about 12 cookies on each sheet, bake 1 sheet at a time for about 18 minutes, or until dough is lightly golden brown. (Leave remaining cookie dough in the refrigerator between batches). Allow to cool for 5 minutes or so on the baking sheets until firm enough to move to a wire rack to finish cooling. Handle carefully (the filling can cause the undersides to be sticky).